IMGP2229, originally uploaded by Mic2006. 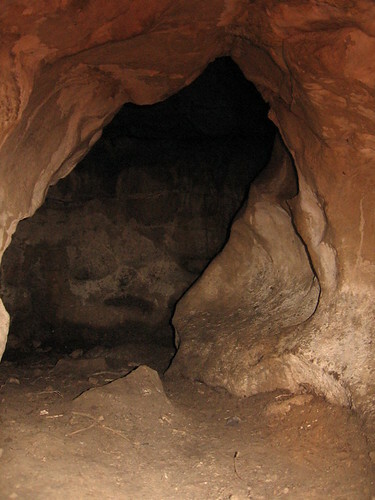 It is a well known fact that 90-95% of Ontario’s caves are within 100 feet of a road. 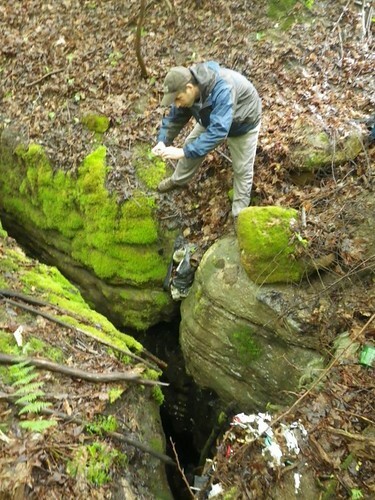 As of late we have taken to exploration in dense tracts of forest over a karst terrain that has been long suspected to harbor the best caving possibilities in Ontario. As a rough guide we have been using an old manuscript that was produced by Martin Davis, he had already visited the area andf for the most part his initial reconnaisance has been invaluable to our success in finding, or re-finding significant karst features. we believe this shaft was first marked on one of Martin’s maps and in looking down it appears to exceed the depth of the abyssthat we found last month and also several other cave shaft features that we had recently happened upon. 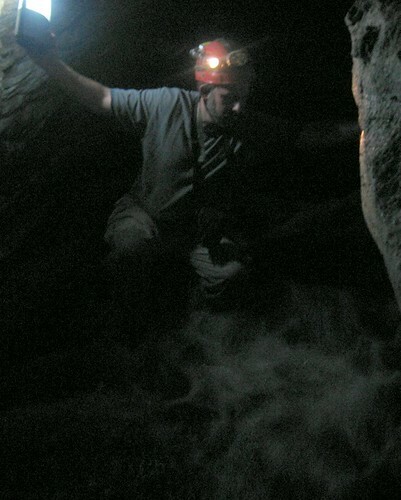 Most exciting about this shaft is the belling out of the bottom reaches so that we cannot see the bottom of the wall beneath where Jeff is standing – in fact we are believing that it could be a tunnel as a surface joint also leads in that direction. 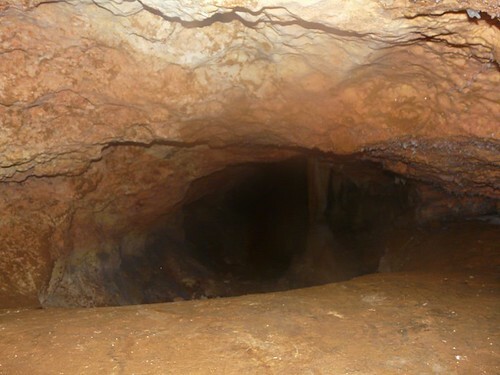 We are intending to descend the pit this coming weekend and answer the question as to whether there is going cave tunnel at the bottom. Check out this video of the cave shaft and also another feature that we are calling the void – cave shaft video here. Intersection of entry tunnel and the first passage – Broken Boat, originally uploaded by Mic2006. 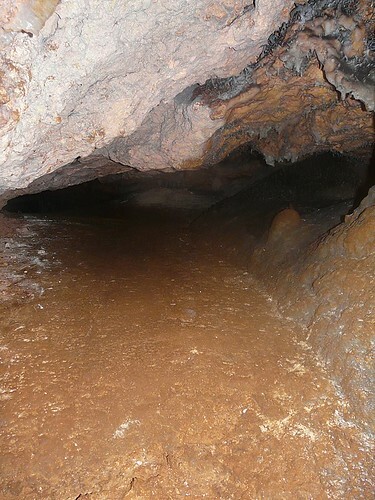 This picture was taken on a recent exploration that JC and I did in an area that has long been suspected of being “cave rich”. In Ongley’s long forgotten cave manuscript he relates the impression at the time of Ontario being a cave desert – a paucity of karst! not so! Theres lots of caves in Ontario you just gotta find them. Marcus Buck said that 90 -95% of Ontario’s caves are found beside a road or path – still true, its because of our rugged terrain and people’s unwillingness to hack through the bush. JC and I do that quite often and sometimes we hit lucky. My book on Ontario’s cave geography “Rockwatching” is again available at Amazon. It appears that it had risen quite significantly in price while it was out of print – Teebooks1 – $156.13, The_Meirin_USA – $94.00, and any_book for – $56.46. Rockwatching is back on at Amazon for $20.96 – buy it and stop e-mailing me for directions to caves, you’ll learn in the book how to figure those out for yourselves. But for now, I hope to update you in the next month or so on our further explorations of Broken Rowboat cave – it all depends on whether the location is totally snowed in for the winter or not. It’s a hike of several kilometers through some pretty rugged terrain. This picture appeared in the July/August 2008 issue of “Atmosphere” – Air Transat’s inflight magazine. My article was “Beyond the Playa” though initially I had called it “Mario and the Crocodile”. Mario was not one of the fellows in this picture, he was our host and a very decent and generous Cuban at that! My visit with Mario was on the same trip that I visited the Cuevas de Bellamar with Jesus (pronounced hay-zeus). Before dinner we went on a tour of Mario’s farm – he had an alligator on a chain that he goaded for our entertainment. It lived in a scum covered cement pool behind the shed where he kept his Lada. I wondered if I could keep a pet like that, but come to think of it, we have some kind of exotic pet law back in Guelph. ““My he looks like a nasty fellow” I commented to my host. The creature eyed me coldly. “How long have you had him?” “9 years” “ And I suppose you are going to take his belly skin? Use it for handbags? Gangster shoes?” “Si, my pet, I feed”. Still no reaction from the beast, it seemed indifferent to its fate. I doubt that it understood me, but then again, neither did my host. Life never fails to amaze, I wondered at the bond that must have developed over those 9 years. Master gazing fondly over his ill-tempered charge; a rusty chain fastened around its armoured neck. Reaching over in provocation the farmer yanked it’s tether and the beast went absolutely beserk, snapping and thrashing it let loose a fetid hiss from its gaping mouth. Whereas a dog bites at 300 pounds per inch this killer pulverizes bone at a crushing 5000 pounds pressure. I wondered what it was that had bought me here. My resort offered a perfectly suitable meal – rice and beans – typical Cuban fare, and chicken or some kind of fish. “What kind of fish?” I would ask. “Cuban fish” they would invariably reply. 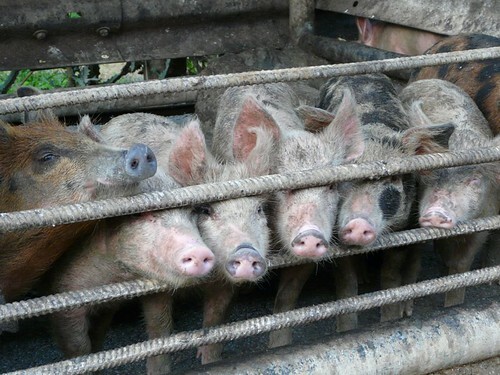 As for the piggies in the picture, sweet and snuffling as they were, I believe we derived a significant amount of guilt. I hadn’t realized that one of their brethren would serve as dinner until a part of him/her appeared with our meal. I believe we would have paid for his freedom if we’d realized the consequence of our visit, but then again, a wild pig soon grows ferule and even uglier, so freedom for these creatures might be good in theory, but in practicality Mario’s family would go hungry and so would we – “Circle of Life”. P1010076, originally uploaded by Mic2006. Shortly after leaving the tourist section of the Cuevas de Bellamar there was this reddish hump in front – it was a rippled flowstone ramp, over which I wriggled and there in front was …..